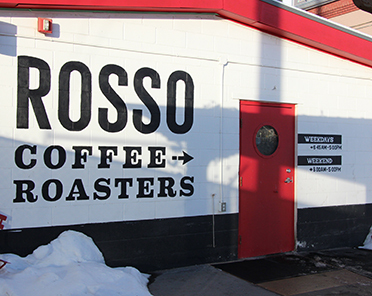 If you want to learn a thing or two about coffee, talk to the folks at Rosso. I’ve been drinking a cup or two a day my entire adult life, but as I found out when I visited the cozy Ramsay location, I didn’t know beans. First of all, coffee is a seasonal crop, David tells me. 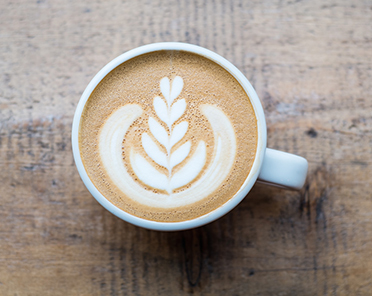 If you’re buying the same varietal coffee from the same growing region all year round, it’s probably not as fresh as it could be. We’re sitting at a round glass-top table just inside the red door of the original coffee house. They’re not really into formal titles at Rosso, but let’s just say that David co-owns the place, while Jessie runs the show. She brings me a beautiful latte and the three of us discuss how they source their beans. “We’re always trying to buy the freshest, in-season coffee,” says David. They’re even heading to Guatemala and Costa Rica this winter to see some of the crops and build relationships directly with growers. The fresh green coffee they buy comes in big jute bags lined with GrainPro to protect the beans. As I smell the unroasted beans (hay; they definitely smell like hay), Jessie explains that the way the coffee is processed will have a big impact on the flavour. In the more traditional dry process, fresh-picked cherries are laid out on patios to dry. This lets the beans absorb the cherry essence and can result in a fruitier-flavoured coffee. In a wash process, water washes off the cherries quickly, leaving just the beans. Now that we’ve tackled varietal, region and process you’d think the coffee would be ready to roast, but not so. The consummate coffee connoisseurs at Rosso still have to find the best roasting variables for that specific coffee. They’ll sample roast 100-gram batches up to 50 times using slight differences in roast time, airflow, starting temperature, etc. until perfection is achieved. To decide which roast will make a coffee taste its best, the team uses a process called cupping, which I think is a fancy term for slurping coffee from a spoon. Of course, there’s more to it than that - as we stand in a small back room beside a table filled with cupping stations, David starts talking about Q grading and refractometers to measure total dissolved solids and other such scientific-sounding things. He describes his brother and co-owner Cole as “the coffee nerd,” but I’m beginning to suspect they all know their stuff. Finally, it’s roasting time. There’s a big, sleek, grey German Probat roaster sitting in a place of prominence just behind the espresso machine. 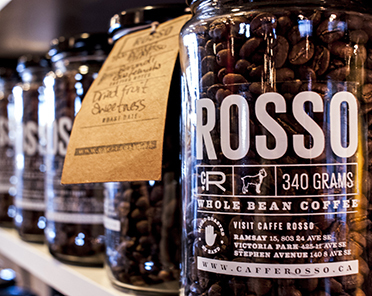 Beans are roasted to order and delivered the next day, so it’s a good bet the Rosso coffee on our shelves is about the freshest coffee you can find. And with a designated roaster watching each batch, a custom program tracking and graphing the roast and the team tasting every single roast before it goes out, you can also bet it’s going to be one of the most consistently delicious coffees you purchase.